It’s hard to understand why one human being would want to kill another. It’s even harder when the two don’t even know each other; when the victim is chosen for some arbitrary reason, such as their nationality. 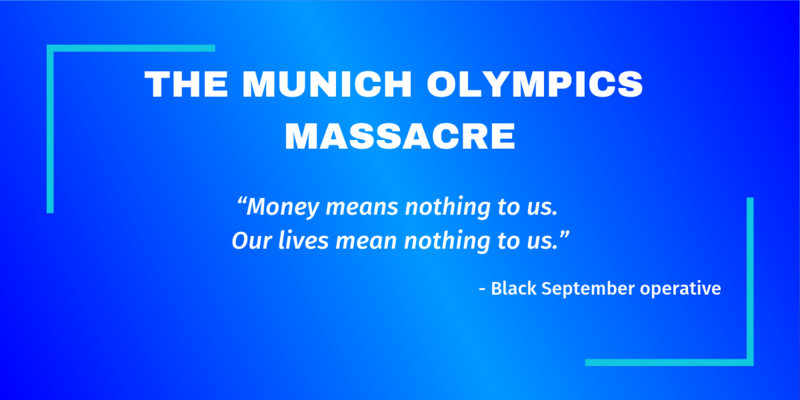 That’s why disasters like the Munich Olympics Massacre are so hard to confront. They are deliberate acts. In this instance, eight men broke into the Olympic Village armed with assault rifles, pistols and grenades, and assaulted eleven unsuspecting men, who had nothing more than kitchen knives to fight back with. Now, it is often said that one man’s terrorist is another man’s freedom fighter, and I understand that the Black September gunmen strongly felt that they had been immensely wronged, but the fact remains that they didn’t care whether the men they killed were in any way personally responsible or not. They were Israeli, and that was enough. This event happened some time before I was even born, but I’ve seen the images again and again; the masked gunman on the balcony, the embodiment of fear. “Terror” today seems to be something that happens every other week, at least, and it often feels like there’s nothing we can do to stop it. Co-ordinated terrorist attacks, like this one, require planning, and there are many points in the process where they can be foiled. If the authorities had paid attention to their own experts, they could have been prepared; Georg Sieber’s Situation 21 almost perfectly predicted the attack, to the last detail. If the authorities had been better prepared to respond, the rescue need not have turned into a bloodbath. All these “ifs” do two things; they help us prepare for similar acts, and they make us grieve that we weren’t prepared to start with. 35 years later, the conflicts that triggered this atrocity remain unresolved. We can only continue to hope that love can conquer hate. 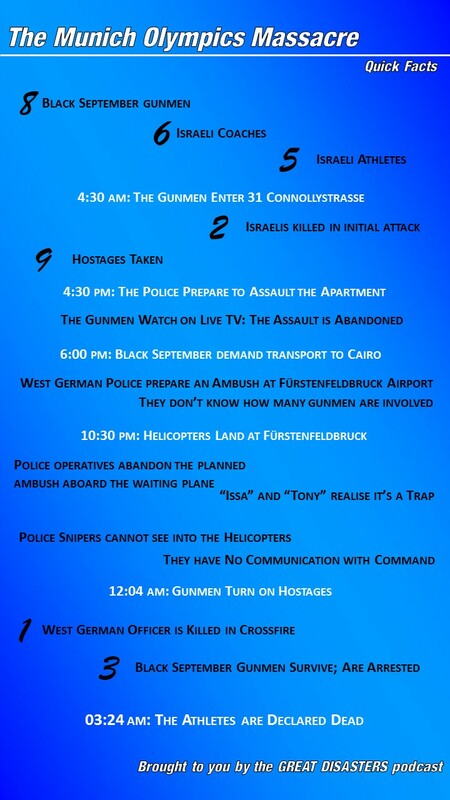 Note: I deliberately chose to omit the names of the Black September gunmen from the episode. This is not a stance on the wider Israel-Palestine debate, just my stance on their actions. The 1999 documentary film One Day in September is well worth watching; note that it is, in parts, graphic. The 2005 film Munich starring Eric Bana focuses mostly on the aftermath of the attack, but it is gripping and provocative.